These days, big lunches under $10 are hard to come by. On a blasé day about a week ago, I was having a rough morning and the raw feeling of autumn in Boston finally got to me. A friend of mine had asked me if I wanted to go on a lunch date during our mid-day hourlong break between classes and I willingly accepted. Treat myself – that’s what I needed to do. 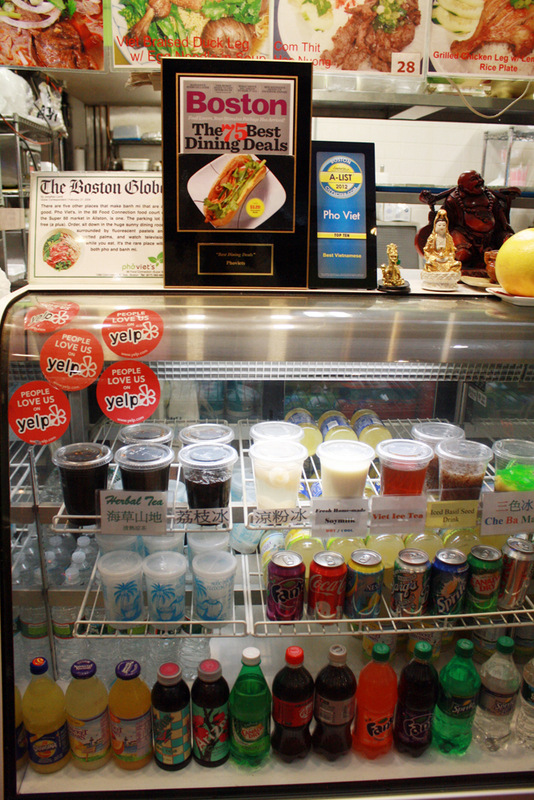 We can all admit that although Boston University Dining Services treats us pretty well most of the time, it is always refreshing to eat a meal anywhere but in the usual dining hall. My friend and I both decided we were craving Asian food; there are quite a few delicious options nearby to choose from! There was a food truck outside, but we were looking for a quick meal, ideally out of the bluster. My friend had high praises for Super 88 Market and I was intrigued. Yes, the place by Star Market on Comm Ave; you’ve probably seen it before. And yes, from the outside, it does look kind of sketchy and not like a place I’d stop into for lunch, but I’ve learned not to let exteriors scare me. Trust me on this one: what’s inside is worth the visit. Sniffly and cold, I knew I wanted something warm, a soup of some sort, perhaps. Upon entering, I was faced with a food court-style dining room, and to my right, was the market. I was starving and I couldn’t wait. I curiously walked through, weighing my options. There was Korean, Indian, Lollicup for bubble tea, Vietnamese, and Chinese. 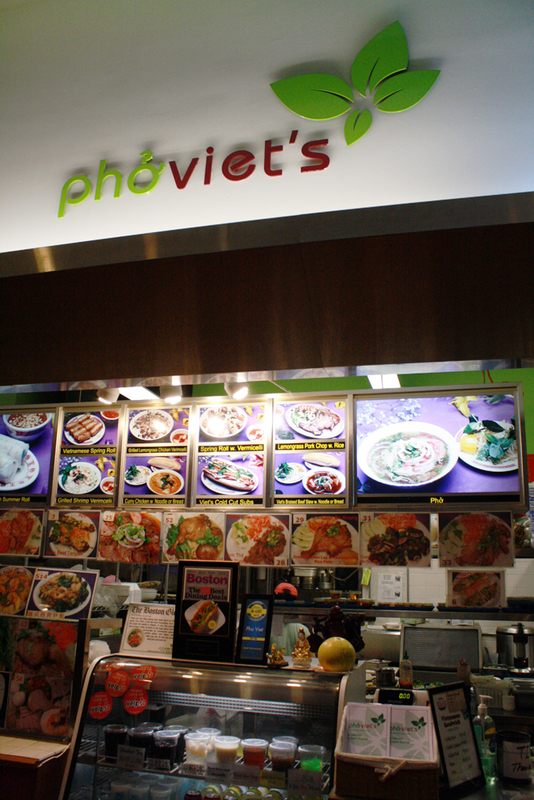 I love them all, but a big bowl of Vietnamese pho sounded like just what I was craving. Normally, I’d go for the tofu and veggie, but going with the theme of stepping out of the norm and trying new things, I opted for something heartier. I ordered pho with seared “rare” steak. My friend raved about the Vietnamese sandwich he had tried before, but went for a plate of short ribs of some sort and rice, instead. I was concerned about making it to my next class on time, but I was surprised and pleased that our orders were ready so quickly. Accompanying my soup was a side of bean sprouts, hot peppers like jalapeños, scallions, which were already in the broth, and of course, a bottle of Sriracha to take back to the table. I happily utilized the traditional complimentary toppings, and naturally, I doused the whole thing in the chili sauce. The hotter, the better! To each, his own, but the spicy effect was especially comforting for my seemingly imminent cold. Looking at my friend’s plate, I appreciated the generous portion of fresh, bright, colorful vegetables that came with it. Also, the portions were rather large, perfect for packing up and saving for another lunch the next day. Full and content, I declared I could not fit another bite, but my friend insisted that I also must try a Lolicup bubble tea for dessert. Having always strayed away from bubble tea per warning of a yogurt shop barista back at home, I was a bit skeptical, though I have an undeniable love for tea. I tasted the regular milk tea with boba, for my first time, and I was pleasantly surprised. Super 88’s location, being so close to my dorm, combined with unbeatable prices, are good enough reasons to go back. I would return to sample a new cuisine, or even just to eat what I had the first time! I am unaware of the nutrition facts of this meal, but I choose to stay that way because every once in a while, I enjoy an indulgence. I recommend giving Super 88 Market a try if you’re interested in trying something new or are looking for a filling, inexpensive meal and have little time to spare (or simply just a change of pace from the dining hall!). I profess that this dining experience is anything but gourmet, but it was enjoyable, made me feel better, and I made it to class on time– and that’s what matters to a college student. Essential Info: 1 Brighten Avenue Allston, MA (617) 787-2288 Hours: Monday to Sunday, 8:30 a.m. to 11 p.m.